- STORE LINK: WAREHOUSE NINE. Your emails are welcome before and after the sale! We will be here for many years to came and continue to support our customers. This is the upto 4CPU edition. Not to be confused with the limited 2CPU edition. We have the 2CPU edition if you need it. PHYSICAL ALL NEW (Not used or'NEW-other') in factory sealed pack. Sealed Genuine Windows Server 2012R2 upto 4 CPUs Includes Physical 25CAL Certificate. This is a media less pack. A burned DVD can be sent along with Server 2012R2 program on it. Materials only, NOT a'credit key card' bogus'license' that will never pass audits. We include an actual Microsoft CAL certificate that will pass audits. With SQL key code for. Proof of Licensing and in case of Microsoft audit. (CAL Certificates are not' letter' size or 8.5"x11" in size). Guaranteed to authenticate during install with Microsoft via the internet. (other sellers don't include CAL Certificate). This license pack does not require nor include a COA sticker. Beware of'Bait and Switch Photo' sellers. Seriously: NO authentic Microsoft media. (or Certificate at all) from them. We don't use Microsoft logo photos and then photoshop them. As they do not send the items shown in their photos. What you see HERE is what you get! Original Microsoft Physical CAL Certificate w/license activation code affixed. If they reply the answer may surprise you. You DON'T get either Authentic media, No MS DVD, No MS USB. But it's a nice photo of a DVD and/or USB, eh? SOME Sellers ignore your incoming emails, you can bet they will ignore your emails AFTER the sale as well. Not a fair deal or trade 4 U.
BEWARE of sellers with HIDDEN feedback? See our open visible feedback. OUR RECENT FEEDBACK - Open to ALL to view, nothing to hide here. Received fast, activated with no problem. Microsoft Windows Server 2012R2 Standard Server4CPU Key +25CAL FactorySealedPack (#122388927851). Genuine software, zero problems to activate. Microsoft Windows Server 2012R2 Standard Server +10 CAL 4CPU Factory Sealed Pack (#122255080870). Best Offer Price was Accepted. Our GENUINE Microsoft Licenses, software and CALs PASS actual REAL Microsoft audits. A+ Was being audited by Microsoft. Add-on Microsoft Windows Server 2008 08R2 25CALs Standard Enterprise Datacenter (#111874646602). See ALL our listings for SALEs and Deals! We are here to stay and support out customers! GENUINE Server 2012 R2 has become harder to find. Our photo shows EXACTLY what is included! Genuine CAL certificate & PERMANENT Server license key affixed to the CAL certificate. 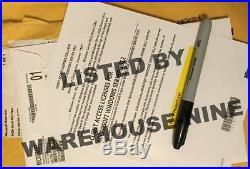 Item in sealed envelope pack, Not a retail boxed item. The 25 CAL's included in this listing. As you know software doesn't always install smoothly and/or some unusual issue can arise (It's Microsoft, it happens). DO NOT open a return or post feedback before contacting us, so we can offer you assistance. Certainly NOT before receiving the item. You agree to this when purchasing. The item "Microsoft Windows Server 2012R2 Standard 1-4CPU +25CAL Certificate Sealed NEW" is in sale since Wednesday, April 19, 2017. This item is in the category "Computers/Tablets & Networking\Software\Operating Systems". The seller is "warehouse-nine" and is located in Encinitas, California. This item can be shipped to United States, Canada, United Kingdom, Denmark, Romania, Slovakia, Bulgaria, Czech republic, Finland, Hungary, Latvia, Lithuania, Malta, Estonia, Australia, Greece, Portugal, Cyprus, Slovenia, Japan, China, Sweden, South Korea, Indonesia, Taiwan, South africa, Thailand, Belgium, France, Hong Kong, Ireland, Netherlands, Poland, Spain, Italy, Germany, Austria, Russian federation, Israel, Mexico, New Zealand, Philippines, Singapore, Switzerland, Norway, Saudi arabia, Ukraine, United arab emirates, Qatar, Kuwait, Bahrain, Croatia, Malaysia, Brazil, Chile, Colombia, Costa rica, Panama, Trinidad and tobago, Guatemala, Honduras, Jamaica.